Toothaches are both painful and extremely stressful and if you don’t have the right medicine lying around, you’re in for a world of suffering. These quick fixes only require items you most likely already have at home and they’ll take only a few minutes to relieve your pain. However, women who are pregnant or who are breastfeeding moms and people suffering from other serious illnesses should avoid these remedies as there may be side-effects. It is best to speak to your dentist before trying any of them. Combine half a teaspoon of salt in a cup of warm water and wash your mouth with it. Saline water has powerful cleansing qualities and can make you feel better in minutes. Using it as mouthwash can remove the harmful germs from your mouth. It also prevents your cheeks from getting swollen and makes your gums cleaner. Hydrogen peroxide is a mild antiseptic. Make a mouthwash that is three percent hydrogen peroxide and 97% water and be very careful not to swallow any of it. Not only does it help to soothe the pain you’re suffering from, it also reduces the buildup of plaque in your teeth and soothes your gums. While the miraculous healing powers of essential oils are rightfully doubted, they are still useful in many ways. Spread a couple drops of clove oil on the part where it hurts and you’ll feel better. 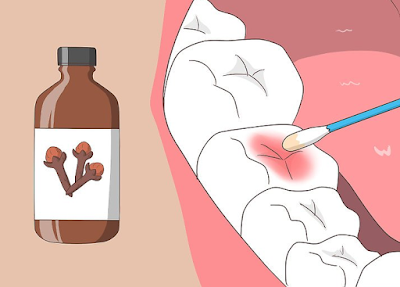 It serves as a disinfectant and it has long been used as traditional medicine for toothaches. An ice pack is good for all sorts of pain and most of us must have used one at some point or the other. Wrap up some ice in plastic and cover it with a cloth. Keep it against your aching tooth and the numbness will relieve you from the pain. This is probably the easiest remedy out there. Garlic glue doesn’t sound very appetizing but it can work wonders for your toothache. By mixing it with a little bit of water you can turn garlic into a gluey paste and apply that where it hurts. You can do repeated applications for one or two days till the pain is completely gone. The microorganisms that are causing you all that pain and destroying your teeth will be killed by the garlic. Chewing on wheatgrass can help relieve the pain you’re going through. If you’re not big on chewing, you can squeeze out the juice from wheatgrass and swirl it around your mouth like a mouthwash solution. All the toxins in your gums will be removed and the microscopic organisms that are causing you all the pain will be destroyed or at least reduced. Whenever applying any home remedies, you have to ensure that you’re not on any medication that might cause harmful side-effects. If you are taking any medicine, consult the concerned doctor or your dentist before you apply any home remedy.